While most desktop printers can do most printing jobs fine, not least letters, invoices, or photos, at some point you may find that your desktop printer is just too small for what you need. In which case, it's time to look at your options for a large format printer. This is especially the case when dealing with really large graphic files you need to print, which could be anything from portrait photos to posters, or technical data such as real-estate blueprints and maps for CAD or GIS. The underlying technology for large format printers remains the same as your desktop in terms of using tiny inkjets to print the material you need, but large format printers aren't simply about scaling up the technology as much as preserving detail and making sure this remains crisp and clear, no matter how big the paper size you're working with. So to help you out, here we'll list the best in large format printers, starting at the lower end of the budget range and building our way through to the more expensive models - with the caveat that we're focusing on large format printers for paper printing, rather than wide format printers that use vinyl for signage printing. There are a number of budget models targeted at larger photo printing, but the Epson Expression Photo XP-15000 is definitely one of the stronger models out there and worth considering if you need to look around the cheaper range options. It has a wider range of ink colors for HD-quality color printing, including the new red and gray range, and can handle borderless prints of up 13" x 19" in size at an astonishing 5,760 x 1,440 dpi. While it can handle monochrome document printing, this would be probably be overkill, especially when considering the high-running costs involved in replacing the inks. There are no card slots, which may put some people off, but this is a printer built to work wirelessly from your desktop or laptop, or even camera. For those used to working wirelessly this will definitely be a plus, as it means you don't have to juggle a collection of SD cards. The HP DesignJet T120 is the entry-level workhorse for the Hewlett-Packard large format printer range. It can print from rolls as well as sheets of up to 24" wide in full color. Although it does have a card reader, it's also a wireless printer with the added benefit of being able to print directly from a mobile device, such as an Android phone or iPhone, as well as a desktop. It also has a touchscreen for setting up options and controls. Color range is good, provided by a standard CMYK set of cartridges, which can be easily replaced from the front. This makes the HP DesignJet T120 a good all-rounder, for printing photos as well as diagrams and documents across a wide range of needs. With a print resolution of 1,200 x 1,200 dpi, it can get print to a high enough quality for most needs. The HP DesignJet range is already well-established as one to watch out for, but the HP DesignJet T120's biggest selling point isn't just its versatility, but also its cost. Though the list price is given at around $1,200 you should be able to find distributors able to competitively discount that, which makes the HP DesignJet T120 a real budget option for smaller companies without feeling like sacrificing anything in terms of quality. The Canon imagePROGRAF PRO-2000 is where we see our featured large format printers become really serious in terms of both quality and price. This behemoth of a 24" printer offers sharp, professional colors, not least by using the Canon Lucia Pro ink set which offers eleven colors inks and a Chroma Optimizer. It's also a big and heavy machine and likely to need to a couple of people to set it up in position. Once done, though, it can print from USB, Ethernet, or wirelessly. With a 320 GB harddrive, it should be able to cope with most any filesizes you need to use. While you could probably run it directly from cold, users could probably benefit from calibrating the settings to get the most out of the Canon imagePROGRAF PRO-2000. This is especially the case for professional photographers who will need to ensure print quality properly reflects lighting and setting. However, in general terms this really is a quality machine aimed at the professional rather than casual users. While the Canon imagePROGRAF PRO-2000 prints can print up to 24" wide, it's larger siblings, the PRO-4000 and PRO-6000, can be treated as like the same machine with greater widths, being able to work with feeds of up to 44" and 60" respectively. The HP DesignJet Z9+ leads the next stage up in large format printers, being able to handle prints of up to 44". It also comes with a touchscreen, 500GB harddrive, automatic rollfeed and cut screen feeder, and a set of 9 ink colors. While the number of ink types isn't as high as the Canon above, HP cover this through advances in printhead technology and HP Pixel Control, which aims to ensure that print quality is rich and sharp in both color and detail. It also has its own in-built built-in spectrophotometer to reduce the need for reprints. The HP DesignJet Z9+ really does deliver on exceptional high-resolution prints. However, the main aim of the DesignJet Z9+ isn't just to work with quality, but also work at faster speeds. It advertises a rate of 185 square feet per hour (71.4 m²/hr), which is much higher than earlier DesignJet series from HP and many competitors, though of course print speed will depend on print mode and media type. It also offers both wired and wireless printing, the latter through a secure connection. As expected, this is a machine strictly aimed at professional studios and offices, where large format graphics are a real concern. This is reflected in the cost of The HP DesignJet Z9+, which has a list price of $4,995, though distributors may be able to offer discounted pricing. The Epson Surecolor range really excels when it comes to print quality, and the Epson Surecolor P20000 is no different. Designed specifically to handle mammoth color prints of up to 64", it can work with everything from cut sheets to rolls, plain papers to photographic, and even poster boards. This is a machine that's built for heavy-duty use, and can be left all day to get a queue of jobs done. It also comes with a fast print mode for printing at 600 x 600 dpi at around 44 square feet an hour 17.5m2/hr. While not as quick as the HP above, that's fast for a large format printer of this size. As expected with the Epson SureColor range, print quality is excellent. The machine uses Epson UltraChrome Pro nine-color pigment ink, which work through a 10-channel PrecisionCore Micro print head to work at resolutions of up to 2,400 x 1,200 dpi. It's operated through a touchscreen pad that will probably be familiar to existing Epson users, with the menu options clear and easy to use. Overall, this is a seriously heavy-duty machine for heavy-duty print work. And if 64" sounds a little too big for you, it has a smaller sibling, the Epson SureColor P20000, which works with print sizes of up to 44". In terms of price, expect to pay around $11,995 for this machine. We've featured five of the best large format printers above, while trying to cover a good range of both print sizes and price options. 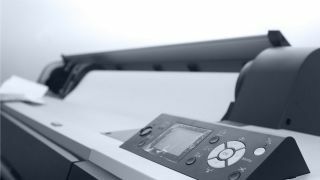 And these are really key points you'll look at when choosing a large format printer: what size you need, and what your actual budget can manage. Then there are print quality concerns - do you need the attention to detail that the Epson Expression Photo XP-15000 delivers? Or will you be find with the 1,200 x 1,200 dpi the HP DesignJet T120 offers? Additionally, is speed of print runs important to you enough to look more to the HP Designjet Z9+ over the Canon imagePROGRAF PRO-2000? Really, though, the most important consideration when choosing a large format printer is what support you can get. And by this we mean not from the manufacturer but from the dealer. It's critical to be able to pick up the phone or email a dealer and get a relatively fast and helpful response - and, if there's a technical problem with the printer you can't fix yourself, then you need your dealer to be able to come out and address that in a reasonable time. Ultimately, it's dealerships that will keep your large format printer running worry-free, so it's important to be able to meet and talk with any local dealers to see which ones you may be happy to work with. Additionally, don't be scared to ask around for recommendations and don't be surprised if one or more are especially recommended as excellent. And, also, although we've featured five of the best here, your dealer may advise a different machine. If that's the case, do listen to them, as it may be the case that certain other large format printers offer other benefits we haven't been able to cover, such as ease of technical repairs, or even comparing ink costs to actual print runs you personally require.